Last night for dinner I made sushi. I made the usual California rolls, because it is cucumber season of course, but I also made a spicy tuna roll. I also made a miso soup, and my wife made some quick pickles as tsukemono. It was a really nice meal. Two nights ago, I made a Thai curry. It was a yellow curry, with chicken, potatoes, and onions in a cocoanut milk base with some ground peanuts (read: peanut butter). It was pretty tasty. We eat quite a bit of Asian food in our house, but three nights ago we had taco salad. This morning I'm making hashbrowns for breakfast. How would I describe the food in our house from a general overview? 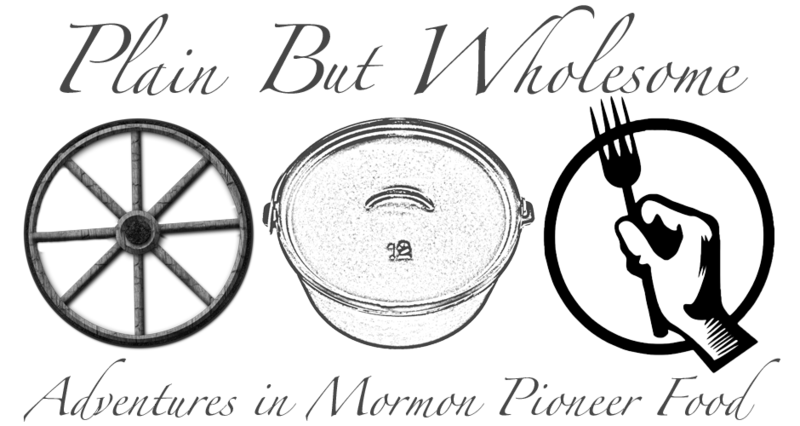 So as I'm writing this stuff about Mormon pioneer food, I'm trying to describe what the common threads were in their daily meals. Eliza Brockbank Hales summed up the diet of her youth with the preface, "I was born in a one-room home in Spanish Fork." She says, "Our food was plain but wholesome. We had milk, home-made bread, vegetables, dried fruit, and meat. Our home cured. hams were tops. We also had a barrel of corned beef and a good root cellar for potatoes, apples, vegetables and so on." So there you have it: the typical Mormon pioneer diet. How would you describe yours? Sushi! I haven't made my own sushi since I moved to Idaho 2 yrs ago (haven't found a good fish monger yet). I used to be more foodie-ish but have start to come back to roots with comfort food, particularly from my parents and grandparents. Last night I made porkchops with cream gravy over rice and thought of my daddy who made it every Sunday (he was finally released from stake callings and home for Sunday dinners. He took over the Sunday Cooking.) It was a typical meal from where he grew up in southern Georgia. My mom often made fried chicken for Sunday dinner, and Dad always made the gravy. He'd present it to the table very officiously, and announce, "This happens to be one of my better gravies."